After being separated for most of last week, Team Philippines reunited in Manila after visiting cooperatives, lending institutions, and farmers in two different locations: northern Luzon (far north of the Philippines) and Mindanao (far south of the Philippines). 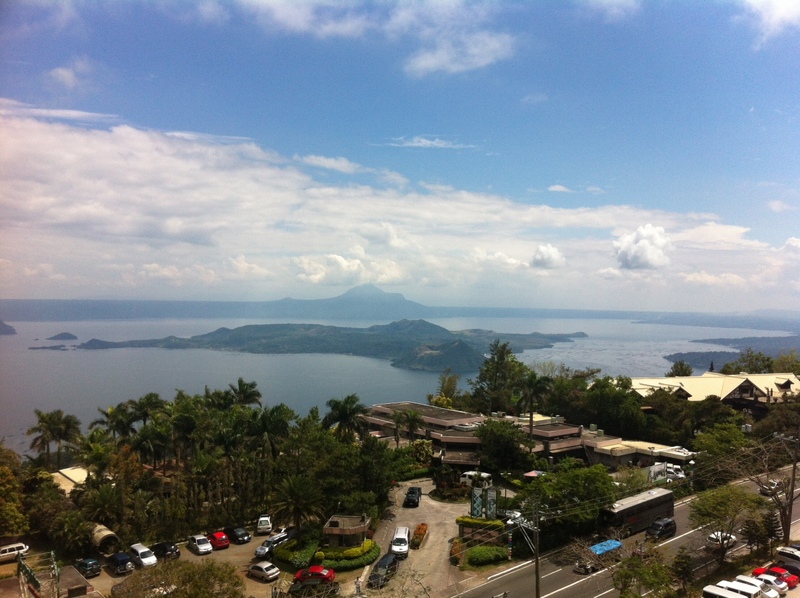 In our last post, we mentioned our rejuvenating day off in Tagaytay. The beginning of this week has involved more site visits, including interviews with Filipino coffeeshops, institutional buyers of vegetables, government-owned financial institutions, microfinance NGOs, and government programs that secure agricultural loans for lenders and borrowers. 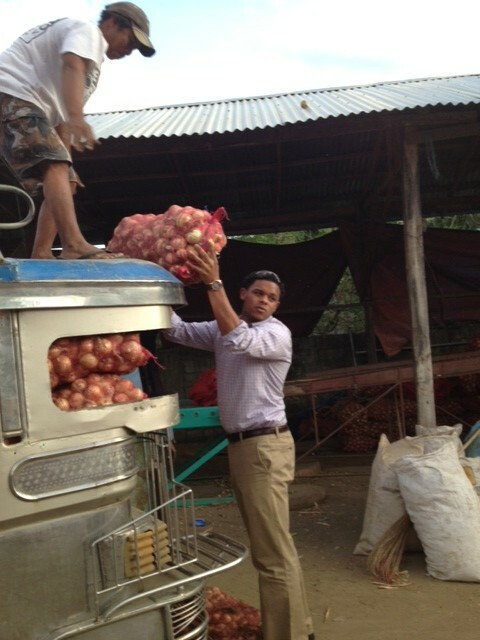 Mauri Miller (law student) helping to unload onions from Kalasag cooperative. Meeting with Mapita farmers, who produce tomatoes and bell peppers. The drying facilities for Cafe de Lipa, a Filipino coffeeshop that sources most of its beans from local farmers. 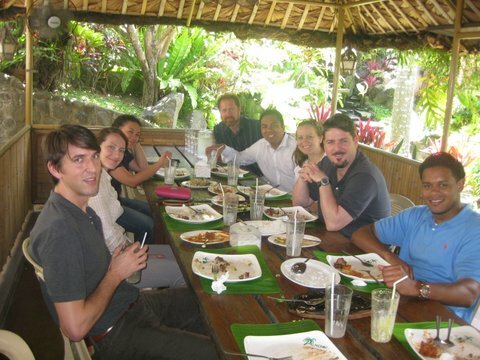 Team Philippines and CRS staff grabbing lunch between interviews. The meetings and interviews that we have had over the past 10 days have been incredibly relevant to our task of evaluating the financial needs of small farmers in the Philippines. Tomorrow (Thursday) is our final day of meetings and Friday we will present our observations, findings, and recommendations to CRS. The past few nights we’ve been working late after full days of meetings, trying to categorize everything we’ve heard and identifying where there is room to introduce new loan products (or expand the reach of existing financing) to farmers to address current gaps in financing. Our thoughts will hopefully come together into something coherent and productive in the coming couple of days, we’ll keep you posted. 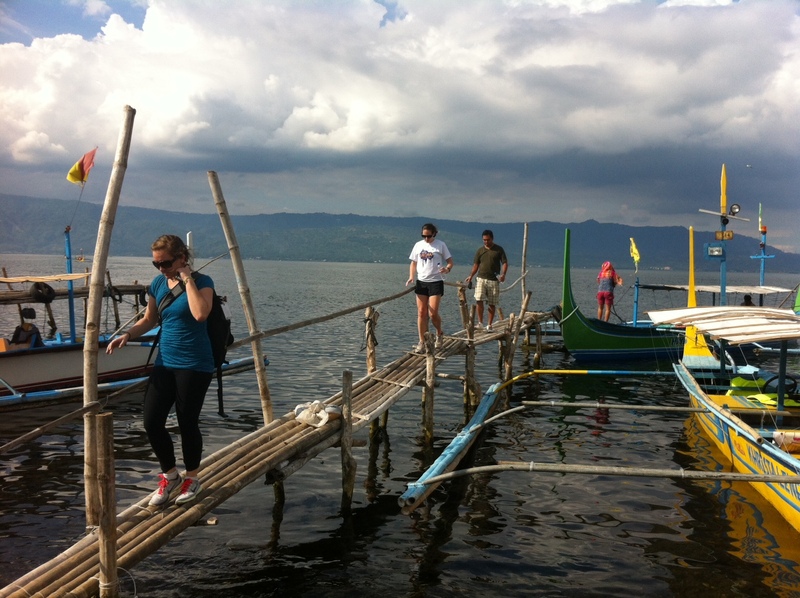 After hard work the past six days, Team Philippines took a day trip from Manila and explored Lake Taal, a large freshwater lake which fills a volcanic caldera which was created by volcanic eruptions hundreds of thousands of years ago. We headed out from our hotel in Tagaytay to a volcanic crater lake within Lake Taal — if that wasn’t clear, we are talking about a volcanic lake within a volcanic lake, think of those Russian dolls, but just with volcanic lakes. The smooth, straight boat ride was lovely, and was just what we needed after rough roads, aggressive drivers, and bouts of motion sickness. 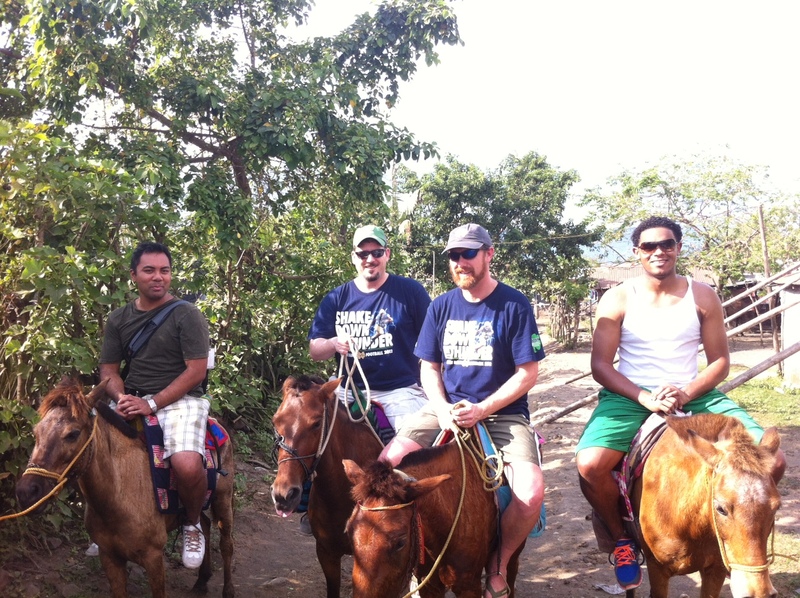 Some of us took horses up the mountain to the volcanic lake (inside the other volcanic lake) and others hiked. But we captured a shot of Team Philippines’ Four Horsemen. Once we got to the top, the lake within a lake didn’t fail to disappoint. 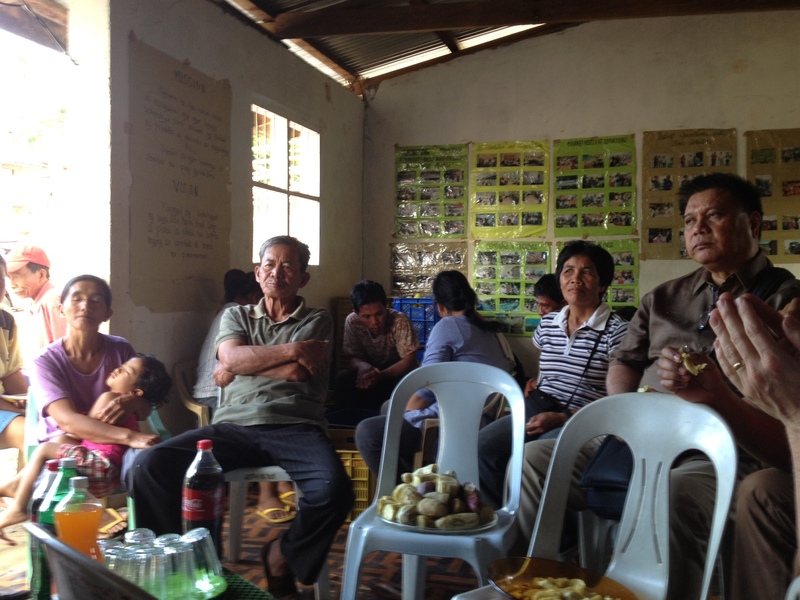 Team Philippines Project: What impact can financing have on farmers? Team Philippines is flying to Manila on Friday to partner with Catholic Relief Services (CRS) in addressing the needs of farmers in the Philippines. The team will be splitting up into two groups for the majority of the week. One team will be staying in Luzon, the largest island and the economic and political center of the Philippines; the second team will head to the southernmost island of Mindanao, the most economically impoverished island that is also very fertile and rich in resources. Team Philippines is primarily attempting to determine where the key financing gaps are in agriculture. The team will also look at the possibility of bringing a mid-level lending opportunity to the Philippines to help clusters and cooperatives expand operations, add value to their products, and increase yields and storage capacities. The team will attempt to assess the current level of financing available to farmers and cooperatives and whether mid-level capital investments would help move farmers beyond strictly subsistence-level farming. 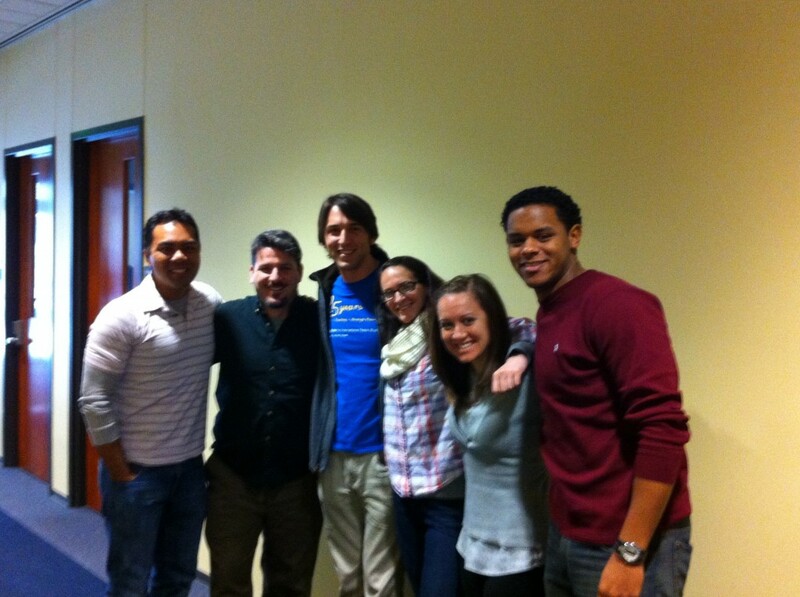 The team is eager to learn from the long-term involvement of CRS in the Philippines. CRS has worked in the Philippines since 1945 and has been involved in agroenterprise since 2005. In the agroenterprise sector, CRS has focused on organizing farmers into single-crop clusters. The organizing of small groups of farmers into clusters allows the farmers to collectively produce sufficient quantities of product in order to reach markets and buyers directly, without having to sell their products to mobile traders who pay only a fraction of market value. Team Philippines will be meeting with many of the clusters and cooperatives that CRS has organized. The team also has meetings and interviews planned with other key stakeholders: microfinance organizations, government agencies, insurance providers, corporate markets/buyers, traders, CRS’ NGO partners, among others. The team is excited to hear from all key stakeholders in agriculture to get a sense of how more farmers in the Philippines can move beyond subsistence-level farming and ensure secure livelihoods well into the future. About: Joined the NDLS faculty in January 2012. Prof. Alford teaches and writes in a wide range of subject-matter areas, including international trade, international arbitration, and comparative law.